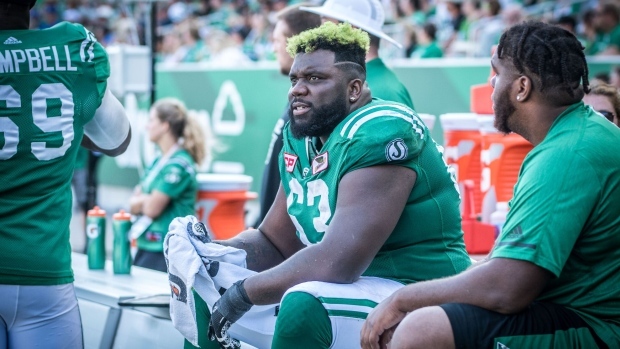 International offensive lineman Derek Dennis is returning to the Calgary Stampeders, three days after being cut by the Saskatchewan Roughriders. The Stampeders made the move official Friday. Dennis left the Stampeders last off-season for a big money deal with the Roughriders, but lost his left tackle job with Saskatchewan midway through last year before getting released by the team. "We're obviously very familiar with Derek and I'm pleased that he has agreed to come back to Calgary," Stampeders GM John Hufnagel said in a team release. "Derek established himself as one of the top tackles in the CFL during his first stint with the Stamps and I'm looking forward to seeing him play at that high level for us again in 2018." Dennis will return to Calgary where he was named the league's Most Outstanding Offensive Lineman in 2016. "I'm excited to be back with the Stamps," Dennis said in the team release. "It's a great feeling knowing that I had a chance to return to Calgary and I'm looking forward to picking up where I left off in 2016."